In a world that strives to be green and is weighed down by austerity, growing cannabis efficiently is a must. Here is how to slash energy bills and account for your spend! Growing cannabis can be a rewarding and fruitful endeavour. It can also be a costly one. An indoor growing system is designed to improve upon nature and provide a healthy, consistent environment your plants can thrive in year round. Your lights simulate the cycles of the sun, and you never have to worry about a cloudy day. Advancements in indoor gardening technology have really made it simple for anyone to get involved. Equipment prices have come down and are within reach of the beginner home grower. The ongoing cost of power, however, can get out of control if you are not careful. Cultivating cannabis requires a proper environment, often requiring lights, fans, heating and cooling, which all puts a drain on your power. Here are some things that you can do to prevent your grow breaking the bank. Balancing your temperature and humidity is the fundamental juggling act you will perform as a grower. Once you add a couple of lights to a 23°C room, you end up with a 32°C degree room. You can't grow cannabis in a 32°C degree room, so what do you do? Now you have to crank your AC. You get to live in a freezer for a house, but at least your crop will look good. As soon as your temperature has balanced out, you find that your humidity level drops. Now you need to get a humidifier to solve the problem. The result is you having lights, AC, and moisture being pumped into the air, with your cash being pumped right out of your wallet. Once you start to grasp the power requirements of running your own home grow, you can begin to see the intricate implications that growing indoors has. 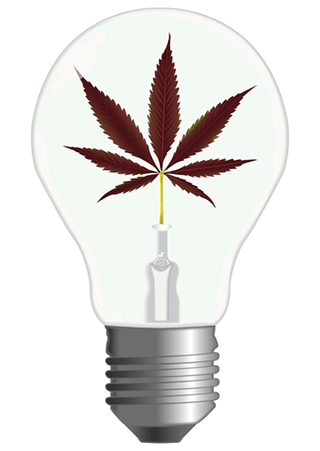 It is currently estimated that 1% of all the electricity in the US is used to grow cannabis. So definitely don't be surprised to see a bump in your electric bill. When you are looking to bring down the cost of your grow, what you are really looking for is efficiency. Getting more for your money with lower power bills and bigger yields is the name of the game. It always goes back to maintaining your environment. If your plants are out in an open room, sealing out drafts and blocking unwanted light can be a challenge. Limiting the size of your environment by using a grow tent is a great idea. It also gives you a much more manageable area in terms of costs. Isolating your plants makes maintaining conditions much easier than in a room with a leaky window. Plus, it’s always easier to cool a small tent than an entire house. By far the single biggest drain on power in a grow is the lighting system. There is such a wide variety of bulbs and lighting systems out there now, all with their own unique power needs. If you know your way around a grow room, you should be familiar with the 600 and 1000W high-pressure sodium and metal halide bulbs that seemed to be a staple of the cannabis community. Companies are moving away from these lighting technologies and moving toward new developments in plasma, ceramic metal halides, and everybody's favourite, LEDs. LEDs used to grow cannabis have had astonishingly good results. If you are looking to save money and be on the cutting edge of cannabis production, LEDs are the way to go. Not only will LEDs bring your power costs way down (to the point where lighting costs are negligible), you won't have to incur the cost of changing your bulbs out every couple of months. LED lights are designed to maintain consistent light output for a very long amount of time. They won't dim when they're on the way out, they just stop. Not only this, LEDs run cool, meaning costs are cut on cooling and ventilation. We live in an era where green technologies are in, and heavy carbon footprints are out. The cannabis industry has yet to catch up with the times and go all in with renewable energy. Solar, wind and battery technologies are starting to catch on, but the cannabis industry has yet to look to these alternate sources of power for relief. That doesn't mean that you can't start looking to new and greener technologies to power your home grow. Do-it-yourself solar kits are starting to make their way into the market. How long do you think it would take for solar panels to pay for themselves? Growers can go even further on the cutting edge and start to use the new Tesla Battery. Tesla' new home battery can store electricity during off-peak hours and then can be used whenever you want to set your light cycle, ensuring you a savings on your monthly bill. As growers move forward in the twenty-first century, turning to green solutions for our power needs will be inevitable.